January 24, 2019 – Never before nor ever since has more money been paid for a coin. 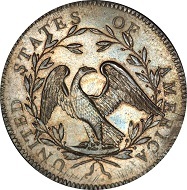 At their Americana Sale on 24 January, 2013, the auction house Stack’s Bowers Galleries sold the 1794 Flowing Hair Silver Dollar for $8,525,000. After addition of the auction fee, the final price of the probably most expensive coin ever sold in an auction was $10,016,875. Thus, it outdid the 1933 Double Eagle that had been sold by Sotheby’s in 2002 for $7.59 million. With the lot number 13094, the 1794 Flowing Hair Silver Dollar was sold on 24 January, 2013, for over 10 million US dollars. The 1794 Flowing Hair Silver Dollar with this grade is considered absolutely unique. It might be the first silver dollar ever struck. 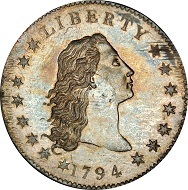 Its minting quality is impressive; especially the fine details in Miss Liberty’s hair fascinate collectors and dealers all over the world. The coin is now owned by Legend Numismatics. Experts from the companies Heritage and NGC were consulted on 24 January, 2019. Learn more about Stack’s Bowers Galleries on their website. Find the press release about the record-setting sale on CoinsWeekly. Further information on American monetary history can be found online. Would you like to submit a CoinsWeekly Coin Record yourself? Check here which information we need for that.